Configuring automatic backups of your website means never having to worry about losing your website’s data in the case of an emergency. 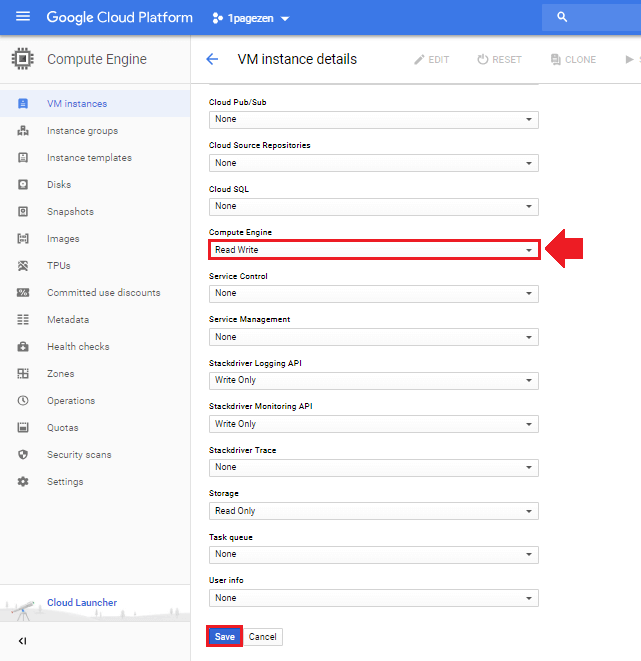 In this tutorial you will learn how to configure automatic daily backups of your website on Google Cloud by configuring an automatic-backup script. The automatic backup script creates a new backup (snapshot) of your website based on predefined specifications which you’ll define in this tutorial. The script will automatically delete the oldest backup file when a new one is created, meaning that the total number of backups available at any given time will never exceed 7. Before stating this tutorial, it is essential that you reserve a static IP address for your VM instance. 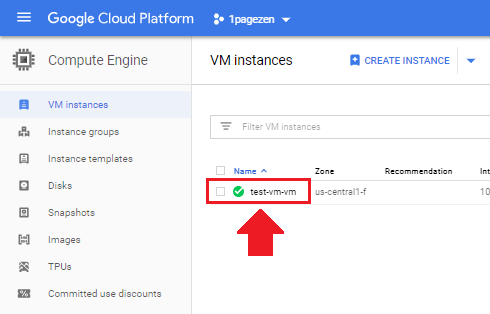 If you don’t reserve a static IP address before starting this tutorial, Google Cloud will automatically assign a new IP Address to your VM instance when it restarts. 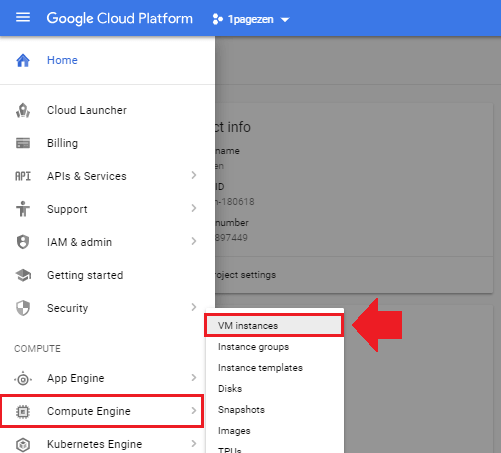 From your Google Cloud dashboard, click the hamburger menu in the upper-left corner of the screen then navigate to Compute Engine > VM Instances. 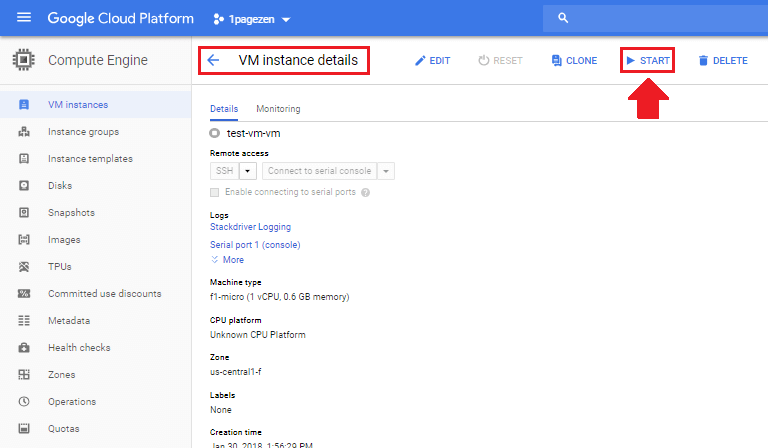 From your VM instances page, click on the VM instance that is running your website. At the top of the VM instance settings page, click the Stop icon, and wait for your instance to shutdown. After it has successfully shutdown, click on the Edit icon. Scroll to the very bottom of the page to the section titled API Access Scopes. From here, change the Compute Engine setting to Read Write, then click the Save button. 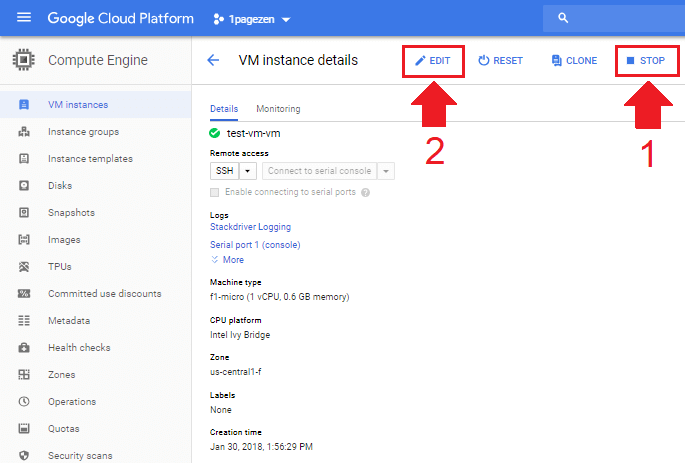 Lastly, scroll back to the top of the page and click the Start icon to restart your VM instance, then click the back arrow icon to return to your VM instances dashboard. 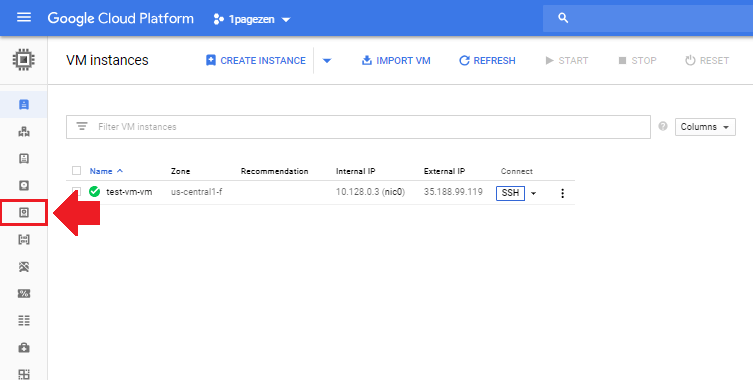 From your VM instance dashboard, click on the SSH button to connect to the VM instance that is running your website. Now that you’re connected to your VM instance, copy and paste the entire script below into the SSH terminal in order to clone the automatic backup script. Now copy and paste the command below to create a new crontab file. In your crontab file, copy and paste the script below at the very bottom of your crontab file, then press CTRL + X, then Y, to save and exit the crontab file. Copy and paste the script below to create a log file which will create a new record every time a new backup file is created. Copy and paste the script below to create a logrotate file, which will ensure that our log file never gets too big. Finally, paste the script below into the logrotate file, then press CTRL + X then Y to save the file. In this tutorial, you configured the system to save a total of 7 backups. You can change the total number of backups to whatever you want, simply by incorporating the -d flag. In the example above, the -d flag is is added to the script to instruct the system to save a total of 30 backups instead of the default 7. You can replace 30 with the number of backups you want to be saved. You can test whether the automatic backup script is working by executing the backup script in your SSH terminal. Execute the code below in your SSH terminal to ensure that your cronjob script is configured properly. Wait a minute or so, then execute the command below to check the status of the backup in your log file. If the backup file was generated successfully, you will see an output similar to the image above. To view your backup files, click on the snapshot link in the sidebar menu on Google Cloud. If your configuration is working properly, you will see a new backup (snapshot) file. Special thanks to Jack Segal for creating the automatic snapshots script. I don’t do snapshot.So if is possible to restore website,before website down.I have backup but is to old,i need that changes that i make and don’t do backup for them. Anyway,great tutorials you have here. Use these instructions for automating snapshots – this way you’ll always have a recent backup of your website in case of an emergency. I already tried everything available online, but nothing seems to work for me, and as you’re my mentor (I used all your tutorials to start my website from the begging) I’m asking you DISPARATELY to help me figure this out. Were you able to fix the error? Also, what changes were you making to your VM instance that may have caused the database issue? If possible, I’d recommend restoring the website from a snapshot (see part 2 of this tutorial for instructions). P.S The issue was caused by the UpdraftPlus plugin, trying to restore the website but the DB was recurred. Again, thank you for the great Tutorials, all helpful and can’t appreciate your effort enough. Thanks for the feedback Ayoub – I’m glad you were able to resolve the problem! -d Number of days to keep snapshots. Snapshots older than this number deleted. So -d is not related to the number of backups. Hi Bruno – thank you for bringing this to my attention! Hi Leron, thank you so much for the tuts! really helpful! [ERROR]: No disks were found – please check your script options / account permis sions. did I miss something on the script? 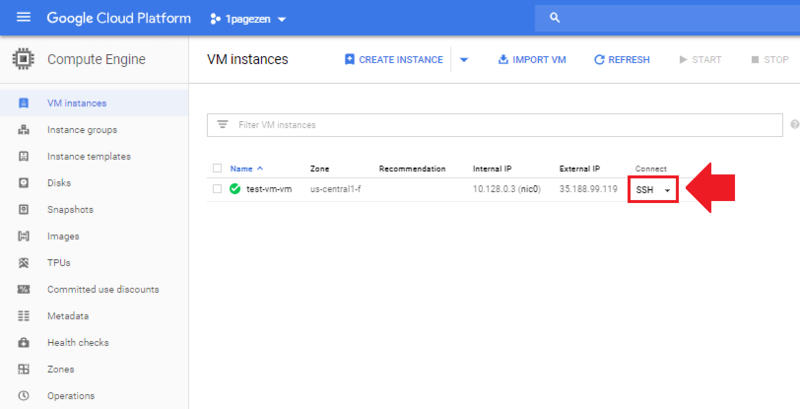 or there is an issue with my gcp? thanks! You can now configure your snapshot schedules through the platform itself, and no longer have to use the shell. See my response here for more information. Thank you very much for your tutorial, it helped me a lot. I tryed too many times reset the machine, install new too many times , restart aphaci but nothing change.. 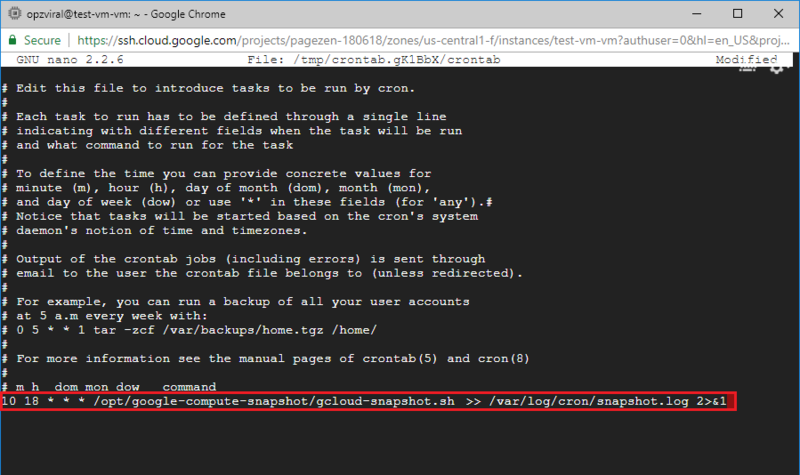 This feature is now built-in to the Google Cloud platform – so you no longer need to manually configure the cron job. From your Google Cloud dashboard, navigate to Compute Engine > Snapshots > Snapshot Schedules (tab). It worked! Thanks! One more thing, can you share a step-by-step guide for Windows VM? I badly need it as a requirement for my implementation. Check out this newly released tutorial for instructions on how to restore your website from a backup! The automated daily creation of snapshot worked but not the deletion. Those snapshots that are 7 days old were not deleted automatically. Can you help me on this? Can you help with automating backups if my website is on a Windows instance? I’m not the best resource for that, as I typically work in Linux environments. If you find a good solution, please share it, as other users may find it useful. Hi. I am getting a message that says invalid -e when I type the sudo crontab -e. I wonder why that happens. Hi Mia – I’m not sure why that’s happening. Please copy and paste the error message and I will see if I can further assist. I am getting this on my log file . Thanks Joe for this great tutorial. I was able to follow all your steps, including the testing part and it worked as you explained. I will create a tutorial on the subject – thanks for the great suggestion! Does GCP costs anything for this auto backups? The pricing of GCP is little complicated for noobs like me. Yes – it’s not free. I just looked at an invoice from a Google Cloud billing account with 26GB of persistent disk snapshots – the total cost was $0.48/month (total price). Remember, you’re billed by the storage resources consumed by your snapshots, not by the number of snapshots you have. For example, a single-page HTML/CSS website with no database could have 100’s of snapshots and it would only cost a couple of cents per month. You can learn more about the cost of persistent disk snapshots here. since my OS is a Debian Unix Server, do I need to install some other necessary packages before performing the procedure of this tutorial ? For example I have to install the git package before, after checking that it is not installed (dpkg -l git) ? There’s no need to install Git or any other supplementary packages. The disk snapshot service is handled outside of your VM, so it will work regardless of your VM configuration. is it working for bitnami version of wordpress? Hi Filmy – This will work for either version of WordPress! I have a question, if I would like to do the same but in a Windows Server 2016 instance, what should I do? Thank you for a great tutorial! Really helpful. I have a little question. First I made a manual snapshot from the GCP, size 2.75 GB, and afterwards I made a shapshot using your instructions here, size 56.75 MB. Can you explain the size difference? The 1st snapshot contains the full backup, then the 2nd snapshot contains only the differences between the 1st and 2nd snapshot. This saves storage resources, and makes the process of creating/deleting/restoring snapshots a lot quicker. You can read more about how snapshots work here. Does taking snapshots and backups take money off my credit ? if it does how can I disable the backups ? The estimated cost for the snapshot configuration as described in the tutorial will be around $0.25 – $0.50 per month. Disable the snapshot by opening your crontab file (from step 3), then delete the script that you added to the file, then save the file. I followed the manual, and the backup was created, now, in case of disaster, how I restore the copy. Create a new instance using the snapshot as the boot disk. Then, switch the static IP address over to the new instance that was created from the snapshot. I go over the process in this tutorial. As I mentioned, if you are restoring a snapshot in order to replace an existing instance, then it is important to assign the static IP address of the old instance to the new instance. You can re-assign the static IP address under VPC Network > External IP Address. its a great tutorial . i have a question i want to set backup once in 7 days instead of daily . can you assist me ? Also, check out this crontab tool that you can use to schedule your crontab with even more precision. Hi, first of all lots of thanks for your excellent job! I managed to copy a WordPress site to Google Compute and it is running much faster than before. I also managed to do the automatic backup. I have two questions: 1. How regularly the automatic backup will run? 2. Our website has 43 articles, each with 1 picture, no videos, and the snapshot is 2.78. Is it not too big? In the tutorial, the backup is configured to run once per day. Regarding the size of the backups – it shouldn’t be an issue. The first time you create a snapshot (backup), the entire contents of your disk are saved. Then, for every snapshot after that, only the changes to the disk since the initial snapshot are saved. For this reason, the snapshot files never take up too much space. Check out the diagrams in the following links from Google Cloud to learn more about how snapshots are stored and deleted. The only little bit of code that appears on this page, in the ‘Testing the automatic backup script’ section that was different from your tutorial was with the word ‘cat’ . See below. Thank you very much for another fantastic tutorial. As always – thanks for the very valuable input! I fixed the tutorial to represent the cat command. Thanks for all that you do to keep these tutorials up-to-date and error free! But you are the one who deserves the all the praise. You are providing an outstanding resource here and I thank you for being so generous with your time to respond to my questions I have even when those issue are sometimes outside of the scope of these tutorials. I can’t say enough about how much I appreciate you. I explored aspects of cloud computing that I would not have had the confidence to take on by myself. You have given me so much help I feel I should be offering you some sort of paying. In fact, would like to contribute a small donation of my appreciation if possible. Do you have a Paypal.me account (https://www.paypal.me/) or something similar so I can give you a token of my appreciation? BTW. Super happy to see my daily snapshots of my Moodle instance in GCP! See screenshot. I appreciate your kind words, and I’m really glad to be of service! And please – no donation is necessary. It makes me really happy to see that the automatic backups are working for you! It’s such a valuable tool, and hopefully the tutorial will become more popular over time. Anyways thanks again for the kind words and for sharing the screenshot. Also, I appreciate you looking over the tutorial, as it’s impossible to catch all of the errors myself. All went great! Thank you very much! Thanks for the feedback – I’m glad to hear it worked for you! OMG, thank you, this is so useful!